Wildlife - eagles, birds, deer, red squirrels, wildcats, etc. 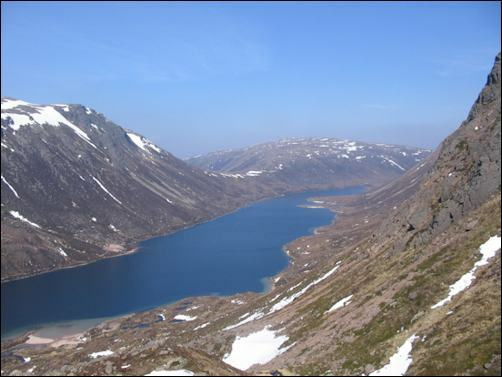 The Cairngorms National Park was officially opened in 2003. Three of Scotland's best hill passes go through here leading to semi-permanent snow fields which can persist into the summer months, remnants of the ancient natural Caledonian Forest and features carved out by the last Ice Age. Thanks to sparse light pollution, the Glenlivet and Tomintoul area has been designated the most northerly Dark Sky Park in the world (and offers some of the darkest skies in the UK). Aviemore is about 30 miles south of Inverness on the main A9 road. Cross country roads can be taken west to Spean Bridge & Fort William and east to Nairn & Elgin. 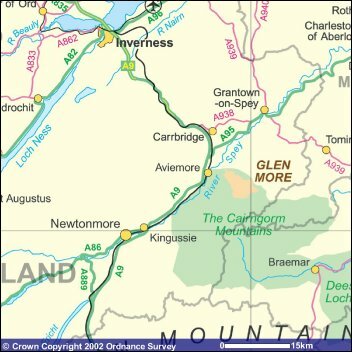 The main railway line from Edinburgh via Perth to Inverness has stations in the Cairngorm area at Dalwhinnie, Newtonmore, Kingussie, Aviemore and Carrbridge. Daily coaches operate between Inverness and Edinburgh with stops at various places in between such as Aviemore and Newtonmore. See the Citylink bus timetables online. For day trips from Inverness by coach to surrounding areas - click here. The nearest airport is 8 miles outside Inverness - see the Inverness transport page for details. Aviemore Car & Van Hire have a variety of vehicles for hire - tel: 01479 811 700. Focus offers vehicle hire from Aviemore - including 4x4, vans, minibus, etc. Tel: 01463 709517. Also available in Inverness (train station and airport). Aviemore Car & Van Hire operates out of Station Square in Aviemore. Tel: 01479 811700. Clansandcastles.com offer itinerary planning for self-drive tours (with car hire if required) and/or accommodation reservations for castles, inns & country houses. Private tour guides also available. Small groups in a car, minibus or a 50-seater coach can be catered for. Each of the professional guides live and work in the Highlands and are keen to share their local knowledge. Visit Clansandcastles.com to find out how to book your tour in advance. Celia Ffitch-Stewart is a fully insured driver-guide with Mercedes limousine for your tailor-made guided tour. Based in Fortrose, near Inverness. She offers half day, full day or extended tours. Airport collection (Edinburgh, Aberdeen or Inverness). Services can include itinerary planning and accommodation reservations. Meet your clan chief, trace your roots, stay in a castle, tour the distilleries. Member of HOSTGA (Highlands of Scotland Tour Guide Association). 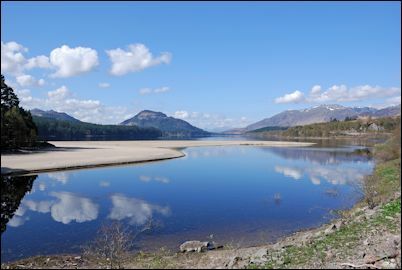 The North East 250 is a new circular tourist trail covering Speyside, the Cairngorms National Park, Royal Deeside, Aberdeen City & Shire, and the Moray Firth Coast. The circuit can start at Glenshee and encompasses both coastal and mountain scenery, as well as museums, castles, distilleries, and much more. There are lots of opportunities for skiing, rock and ice climbing, abseiling, mountain biking, etc. in the Cairngorms. Ace Adventures (based in Grantown on Spey) can offer white water rafting, river bugs and duckies. Also guided river tours in 10-man inflatable rafts along the River Spey from Aviemore to Boat of Garten. 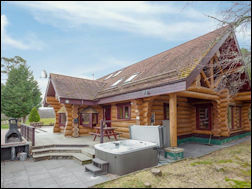 Alvie & Dalraddy Estates (3 miles south of Aviemore) can offer fishing, horse riding, quad bike treks, clay pigeon shooting, archery, deer stalking, grouse, hare & rough shooting, etc. Accommodation, farm produce and estate tours also available. Aviemore Kart Raceway - go karts on a 500 metre outdoor track situated at Granish 1 mile outside Aviemore. Tel: 01479 812079. Badaguish Centre near Aviemore offers multi-activities including indoor climbing, rock climbing, scrambling, abseiling, mountain biking, mountain walking, archery, canoeing, orienteering, etc. Accommodation available. Bothy Bikes in Aviemore offer bike hire and details of local trails (tel: 01479 810111). Backcountry Survival provides tailored courses and packages in wilderness survival techniques and the art of bushcraft. From half-day courses to 3-day expeditions. Based in Aviemore. Contact Neil Foote. Tel: 01479 812 725. C-N-Do Scotland organises guided walking and climbing holidays throughout Scotland with many options in this beautiful part of the Highlands. As well as daywalks, C-N-Do Scotland also have short skills and instruction courses available for winter mountaincraft, climbing, navigation, etc. Craggan Outdoors near Grantown on Spey (Cairngorms) specialises in kayaking, canoeing, raft building, mountaineering, climbing, high ropes course, gorge walking, mountain biking, clay pigeon shooting, quad treks and archery. Bunkhouse accommodation also available. Winner of Best Visitor Attraction award in the Highlands & Islands Tourism Awards 2012. The East Highland Way is a new long distance walking route between Fort William and Aviemore (132 km / 82 miles). In Your Element can offer archery, canoeing, gorge walking and Segways sessions for individuals in the Aviemore/Rothiemurchus area, as well as a wide range of outdoor activities for groups. Mountain bike hire is available (tel: 01479 810284). Canoe/kayak hire is available (tel: 0333 6006008). 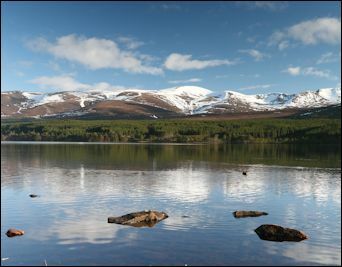 Loch Morlich Watersports offers equipment hire, lessons, activity days and a range of courses. Beach, cafe, changing rooms & lockers. Mikes Bikes at Cyclelife Aviemore, 5A Myrtlefield, (below the chemist) in Aviemore is a bike shop with bikes for hire & sale, repairs, accessories, etc. Telephone: 01479 810478. Newtonmore Riding Centre is located by Biallid Farm. Tel: 01540 670000. Out in the Hills - based in Aviemore, Tim Hall is a qualified Mountain Leader and leads guided walks and wilderness expeditions in the Cairngorms and further afield in the Highlands. Tel: 01479 810570 / Mobile: 0780 112 6137. Scot Mountain Holidays offer a choice of guided walking holidays, self-drive activity touring holidays, accommodation and transport packages for independent walkers, residential courses in navigation, winter skills and mountaineering. Based in Boat of Garten, they specialise in the Cairngorm area. Hostel accommodation available. Talisman Mountaineering/Cairngorm Guides based in Carrbridge will give you expert instruction in all these mountaineering skills, arrange mountain bike tours and take you on guided walks or survival expeditions. The Slochd by Carrbridge offers instruction and guiding for Alpine skiing and Nordic skiing (cross country skiing) in the Cairngorms. Ski hire, cycleshop/workshop, mountain bike hire and self catering accommodation also available. The Ski School - the offical ski school of Cairngorm Mountain Lessons to suit all ages and abilities with friendly and professional instructors (web site includes snow reports and webcams). VisitScotland Skiing web site includes details of all 5 of Scotland's ski resorts. For outdoor enthusiasts in the area, visit the WalkHighlands page about Speyside and Aviemore walks. The road up Glen More past Loch Morlich leads to the Cairngorm Mountain Railway which was opened in 2001 to replace the old chair lift. At the top there is a panoramic restaurant, visitor exhibition and shop (but no access to the mountain summit itself). Please note: the funicular railway and restaurant are currently closed to assess structural damage. For ski passes, conditions, etc. visit the CairnGorm Mountain Ltd web site (tel: 01479 861261). The Cairngorm Ranger Service offers all the information you need at the Ranger Base (located in the Mountain Railway Base Station). Guided walks available. Tel: 01479 861261. WinterNet - lots of up to date info and photos about snow and weather conditions. 31 August: Carve Carrbridge - competition for the best chainsaw carvers from the UK and the World. 12 October: World Porridge Making Championship at Carrbridge. This pretty village is 850 feet above sea level. It has a 9-hole golf course and a pony trekking centre. On Station Road there's a good art studio if you are interested in buying pottery or paintings. 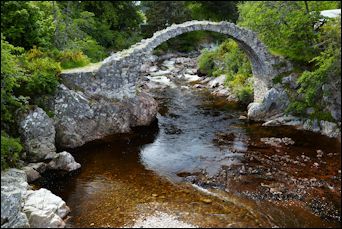 The famous picturesque bridge over the Dulnain River dates back to 1717. Carrbridge.com has further info. The World Porridge Making Championships take place here every October. 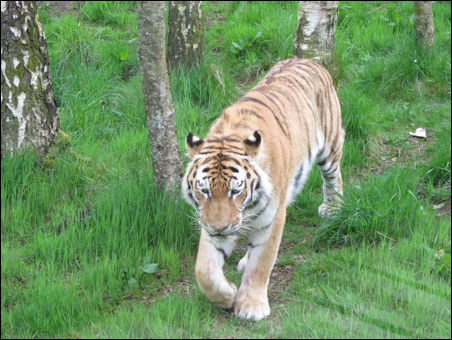 Here you will also find the Landmark Forest Adventure Park, offering a wide range of attractions and activities for all. You can easily spend a day here enjoying the Pinewood Nature Trail with its wildlife feeding area, Tree Top Trail (you might see red squirrels), Ant City adventure play area, Wild Watercoaster ride, Skydive 'parachute' jump , RopeworX and Tarzan Trail aerial challenge courses, Wild Forest Maze, Clydesdale horse, working steam powered sawmill, forest activity area, and the first Rollercoaster in the Highlands the 'Runaway Timber Train'. The Butterfly House opened in 2016. Don't forget the world's first 'bamboozeleum' � a mind boggling collection of illusions, puzzles and strange visual effects. Mini cars, Mini Diggers and remote controlled trucks. Open all year. Family, weekly and whole season tickets available. Most areas are accessible by disabled visitors except the fire tower, Watercoaster, RopeworX, Tarzan Trail, Skydive. There is also a family restaurant, snack bar and shop. Telephone 0800 731 3446 / 01479 841 613. A planned town created by Sir James Grant of Grant in 1766. This is one of the most important centres in the area together with Aviemore. The Grantown Museum is open April to October (Monday - Saturday). As well as hosting exhibitions and a gift shop, it offers genealogy services and free WiFi, and also has the Tourist Information Point for this area (tel: 01479 870477). The Grantown-on-Spey golf club welcomes visitors. Tel: 01479 872079. Balmenach Distillery produces hand-crafted Carounn Gin. Guided tours and tastings available Monday - Friday. Advance booking essential. Tel: 01479 874933. For more info about the town, visit the Grantown-on-Spey community web site. Highland Games usually take place here on the last Saturday in August. 2015 saw the town's 250th anniverary with various celebrations with Grantown 250. 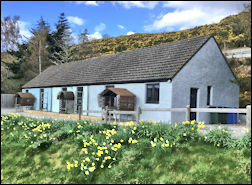 The Grantown East Highland Heritage and Cultural Centre opened in November 2018 (50 years after the railway line closed down in 1968). 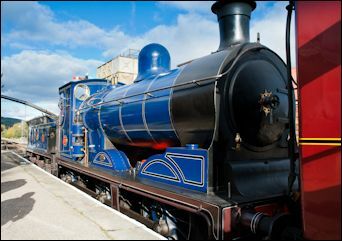 It includes restaurant (in 2 old carriages), gift shop, miniature steam railway and historic exhibitions. From here you can drive the scenic route northwards 20 miles to Forres and Nairn which leads you past the entrance to Castle Grant, described by Queen Victoria as "a very plain-looking house, like a factory". Just 14 miles from Grantown on the A95 is the very splendid Ballindalloch Castle. Home of the Macpherson-Grants since 1546. Extensive grounds and a walled garden. Shop and tearoom. Golf course. Open daily (10.30am - 5pm) from Easter to the end of September (closed on Saturdays). Tel: 01807 500 205. Near there is Speyside Pottery which is open from April to October, daily 10am - 5pm (or by arrangement). Lochindorb Castle is located on the bleak Dava Moor (6.5 miles north-west of Grantown-on-Spey off the road heading towards Forres). It sits on a partly man-made island in this remote loch, and is not accessible by public transport, so you will need a car or bike to get here - and then of course a boat if you want to go across! The best time to visit is when the heather is in bloom and the moor is a carpet of purple. 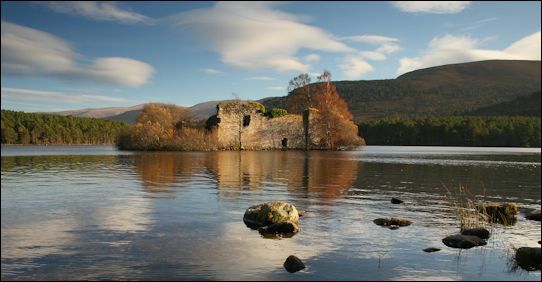 Lochindorb comes from the Gaelic meaning 'Loch of Trouble' and the castle has certainly had its fair share of that! Dating back to the 13th century, it was originally held by the Comyns, but later occupied by the English and was visited by Edward I in 1303 when he stayed here for 9 days, hunting out on the moor. Later it was used as a prison and also a garrison for English troops. At the end of the 14th century, it was gifted by Robert II to his third son, the notorious Wolf of Badenoch, Alexander Stewart, who rampaged around quite a bit of the local area. Lochindorb was said to be his favourite haunt. See historical details in the RCAHMS file. When the Scottish Privy Council instructed the Thane of Cawdor to dismantle Lochindorb after it had been forfeited by the Earl of Moray in around 1455, the huge iron yett was transported to Cawdor Castle and can now be seen in the bowels of the building. Although now in ruins, the castle was still in fairly good condition up until the end of the 18th century when its four 7-metre high round towers were intact. The main quadrangular courtyard is 48 x 38 metres in dimensions and is enclosed by a 2-metre thick wall which stands 6 metres high. A later extension to the south was made probably to give the island extra protection from assault. Apparently it was bought by the Cawdor Campbells in the 1970s. Located on the B970 road between Grantown-on-Spey and Nethy Bridge. Revack Lodge was built as a shooting lodge some time around 1860. Today you can visit parts of the huge estate where there are nature trails, adventure playground, plant centre and garden (orchids a speciality), restaurant and gift shop. Open daily. Coaches by appointment only. Tel: 01479 872 234. Halfway between Grantown-on-Spey and the Boat of Garten is the multi-award winning Speyside Heather Garden and Visitor Centre at Skye of Curr, Dulnain Bridge. See over 300 varieties of heather in the garden, visit the exhibition on the many uses of the plant, buy some to take home, shop for crafts, jewellery, clothes, garden produce. Restaurant (the famous Scottish Clootie Dumpling pudding is a speciality here). Open daily all year (except Christmas Day). Reduced opening hours during the winter. Damaged by fire in 2016 but still open to visitors. Telephone 01479 851 359. Before the bridge that now crosses the River Spey, a ferry used to take people across the water - hence the name Boat of Garten. The Boat of Garten golf course, established in 1898, includes a bar, restaurant, shop, practice net and tennis courts (tel: 01479 831282). Boat of Garten is proud of its recent title as 'Osprey Village' thanks to the stunning birds at Loch Garten where you can use the viewing hide provided by the RSPB (Royal Society for the Protection of Birds). Open daily during the summer. There is also an osprey webcam. There are lots of activities and guided walks during the year. The Boat of Garten Winter Festival is at the end of December. It offers a wide range of concerts, activities and a Hogmanay ceilidh. Boatofgarten.com has further info about this and the local area. Whether you are looking for food or accommodation, visit The Boat Hotel. It has a lounge bar, public bar and award-winning restaurant. It was built in Victorian times as the station hotel for the Strathspey Railway and still retains much of its original character. The Strathspey Steam Railway runs between the Boat of Garten and Aviemore, which an extension to Broomhill ('Glenbogle' in the BBC TV series Monarch of the Glen). Morning coffee, afternoon tea and lunch can be taken on the train. Special Sunday lunch trips also available. Booking is advisable. Closed November - April (except for some holiday specials including Christmas). Telephone 01479 810725 or freephone 0800 085 7273. Timetables and details of special events on their web site. Extremely popular mountain resort with many facilities and lots of all-year round activities: winter skiing, dry-ski slope, theatre, Highland Cattle and deer farm, reindeer centre. Bike hire available from several places on Grampian Road. The town is situated on the main road and main railway line between Edinburgh/Perth and Inverness and also has a direct coach service. Aviemore has free public WiFi thanks to Highland Council. Log on with your social media details or by entering your email address. Aviemore has its own web site which has all the details. Local events here include the following. Torchlight procession through the streets on Christmas Eve. Sled dog rally with over 250 teams competing in various races takes place in late January each year in the Glenmore Forest Park (organised by the Siberian Husky Club of Great Britain). 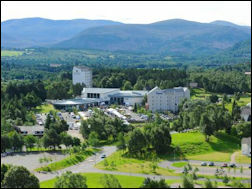 The Aviemore Highland Half Marathon is in October. 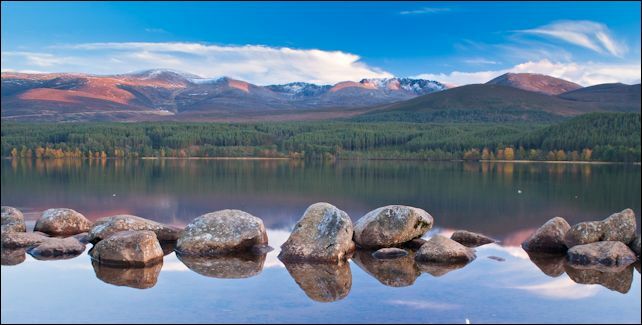 The Aviemore Gallery is 1 mile out of town on the road to Loch Morlich. Artwork, crafts, gifts, coffee shop. Tel: 01479 811987. Alvie & Dalraddy Estates (3 miles south of Aviemore) can offer fishing, horse riding, quad bike treks, clay pigeon shooting, archery, deer stalking, grouse, hare & rough shooting, etc. Accommodation, farm shop and estate tours also available. Tel: 01540 651255. Just south of Aviemore on the B970 past the fish farm is the Rothiemurchus Visitor Centre at Inverdruie. Coffee shop, picnic areas, toilets, etc. Open daily 9am-5.30pm throughout the year. Hire mountain bikes to go exploring on the forest tracks. Get a free footpath map or go on a guided walk with the Countryside Ranger Service. Many other activities available including clay pigeon shooting, off road driving, fishing, birdwatching, Land Rover tours of the estate. The Rothiemurchus Estate also runs the Visitor Centre at Loch an Eilein. Telephone: 01479 812 345. More info available on their web site. Sled trips, sled-dog museum, kennel tours - booking essential. Tel: 07767 270526. Open all year. Loch-an-Eilein Pottery can be found 2.5 miles south-west of Aviemore on the road to Loch-an-Eilein (loch with tiny island which is home to the ruins of a castle). Pottery classes also available. Contact Penny Weir. Tel: 01479 810 837. Self catering accommodation to rent for 3 or 7 days (sleeps 5-6). The Cairngorm Gliding Club operates from Blackmill Airstrip, Feshie Bridge, 7 miles south of Aviemore. Robert Pollock's guide to standing stones and cairns in North and North-East Scotland includes those at Avielochan and Delfour which are located north and south of Aviemore respectively. Take the B970 road out of Aviemore and then continue east for 6 miles (heading towards the chairlift). 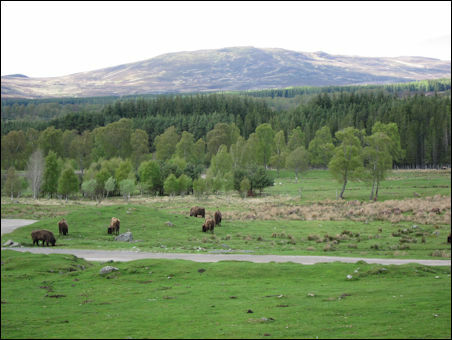 The Reindeer Centre is situated in the Glenmore Forest. Guided visits on foot take you right to the herd and you can touch the reindeer. These leave at 11am every day (and also 2.30pm in summer). At other times of the day you can probably see other reindeer around the centre. Exhibition and shop. Open all year. Admission charge. Telephone 01479 861 228. 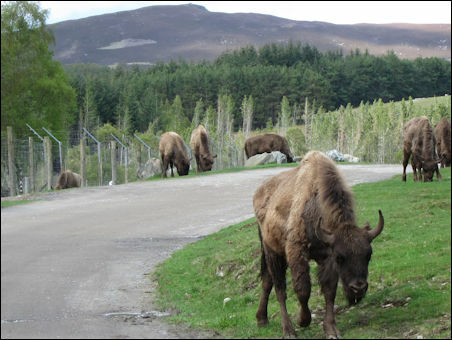 Scotland's premier Alpine Plant Nursery is located 4 miles south of Aviemore on the B970. It is open to visitors from 9am - 5pm daily from mid February to mid November. Walk around the gardens and purchase some of the thousands of plants on display. Mail order catalogues available. More details online... Tel: 01540 651287. Holiday cottages also available. 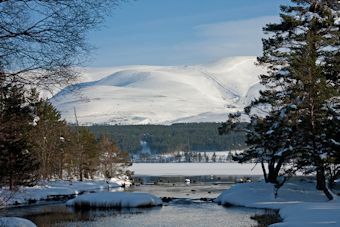 Loch Morlich Watersports offers equipment hire, lessons, activity days and a range of courses. Take part in sailing, windsurfing, canoeing, kayaking, mountain biking and more. Award-winning beach around the loch. Boathouse with changing rooms, toilets, lockers, etc. Cafe with balcony overlooking the loch. Tel: 01479 861 221. Walks and mountain bike trails in Glenmore Forest Park (visitor centre with cafe). Campsite - telephone 01479 861271. Leault Farm at Kincraig offers a 45-minute demonstration where you can see up to 8 dogs working as a team manoeuvring sheep and ducks through various obstacles. Sheepdog demonstrations are at 4pm each day (except Saturday) from May through to October. Contact Neil Ross. Tel: 01540 651402. The name Kingussie (pronounced King - you - sie) comes from the Gaelic equivalent of "the end of the pine wood". Located 764 feet above sea level, this is an excellent walking area. There's also a golf course. The town has a variety of shops for groceries, gifts, etc. plus a bank, chemist, laundrette, garage, sports hall, and the Iona Gallery. Visit the Kingussie community web site for more local information. The Badenoch & Strathspey Music Festival takes place in March. 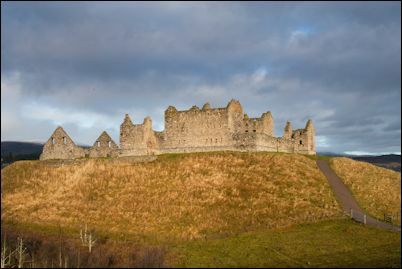 When approaching Kingussie along the A9 from the south, you can see the impressive ruins of Ruthven Barracks to the right of the road. Built in 1719, the barracks were destroyed by the Jacobites in 1746 and are now in the care of Historic Environment Scotland. Ruthven means 'the red place'. This award-winning museum is well worth a visit (not just because it's free!) and is set at 2 locations. 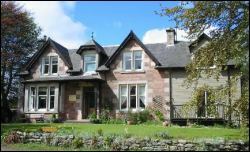 Indoor exhibitions and archives are situated in the museum at Duke Street, Kingussie. The 80-acre site in the neighbouring village of Newtonmore features a wide variety of traditional buildings. Travel in time from the early 18th century Highland township to the mid-20th century working croft. Many live demonstrations can be seen in July and August featuring things such as spinning, lace-making, dyeing, weaving, pottery, blacksmith skills and music. Open daily (10.30am - 5.30pm) from 1 April to 31 August. Open daily (11.00am � 4.30pm) from 1 September to 31 October. Admission free. Tel: 01540 673551. Picnic area, gift shop and toilets. Visit the museum web site for full details, maps and video. Visit the official Newtonmore web site - it has absolutely everything you need to know about the town and its area. The Newtonmore Highland Games and Clan MacPherson Rally take place in August. If you have seen the BBC TV series 'Monarch of the Glen', you may know that 'Glenbogle House' is in fact Ardverikie Castle on the shores of Loch Laggan, between Newtonmore and Spean Bridge. Please note that it is not open to the public, but self catering accommodation is available on 3 properties on the estate. For info about the area visit the Laggan community web site. Tomatin Distillery - tours offered Monday to Friday at 11.00am & 2.30pm. Booking is always advisable. The Visitor Centre is open Monday to Friday 9am - 5pm, also at weekends from Easter to the end of October. Located just off the A9 midway between Aviemore and Inverness. Tel: 01808 511 444. Tomatin comes from the Gaelic meaning 'the hill of the Juniper bushes'. The Macallan - opened a new Visitor Experience including eaterie and shop in June 2018. Guided tours available. Booking recommended. Open Monday to Saturday 9:30am - 6pm and Sundays from 12 noon to 6pm. Situated at Easter Elchies, Craigellachie. Tel: 01340 872 280. Speyside Distillery (Kingussie) and The Snug at the Aviemore Retail Park. Tel: 01540 661716. Glenfarclas Distillery at Ballindalloch, south of Elgin. Open all year Monday to Friday 10am - 5pm during the tourist season and 10am to 4pm. during the winter. From June to September, the distillery is also open on Saturdays from 10am - 4pm. Tel: 01807 500 257. Glenfiddich Distillery, located about half a mile from Dufftown, south of Elgin. Audio-visual presentation in various languages. Guided tour. Gift shop. Complimentary dram. Open all year Monday to Friday 9.30am - 4.30pm. Tel: 01340 820 373.
scotchwhisky.net includes a map of all the local distilleries. and The Good Hotel Guide 2019. Editor�s choice for Fishing Hotel 2016. Traditional Victorian stone built villa in a tranquil setting. Overlooking the Spey Valley and the Cairngorms. Scottish Tourist Board 4 Star Gold. Ideal location for outdoor activities. and a workshop for emergency repairs. Aviemore 13 miles. Inverness 43 miles. Fort William 49 miles. all with TV, hospitality tray, hairdryer, toiletries, radio. Individually furnished and decorated to a high standard. Guest sitting room with open fire in winter. Extensive breakfast menu. Taste our Best award. Tea/coffee and home baking served on arrival. Home made jams & marmalades and home baked bread. Packed lunches available by arrangement. French, German & Italian spoken. B&B prices from £47 per person (2 sharing). Special rates for 7 night stays. Traditional country house B&B near Tomatin Distillery. Salmon & wild brown trout fishing available on the river Findhorn. Dining room and licenced bar. Home cooked evening meals available on request. All with TV, tea/coffee. No smoking. 20 minutes from Inverness & the scenic south side of Loch Ness. Set on the banks of the River Nairn in unspoilt scenery. Deer, red squirrels, otters & buzzards can be seen from the cottages. Primrose Cottage (sleeps 2): 1 double bedroom. Honeysuckle Cottage (sleeps 4 + child): 2 double & 1 bunkbeds. Foxglove Cottage (sleeps 4 + child): 2 double & 1 single. and sitting room with Freesat TV and CD player. Short breaks (minimum 3 nights) available. Lovely old cottage on the River Findhorn. Tomatin 6 miles. Carrbridge 10 miles. Aviemore 14 miles. Inverness 22 miles. Ideal for fishing, shooting, skiing, hiking, watersports, etc. Much local wildlife (birds of prey, deer, etc.). 2 twin bedrooms and 2 bathrooms. Cosy sitting room with woodburner and TV. electric cooker, dishwasher, washing machine, etc. Cot available. Stairgate. BBQ area. Fly fishing for wild salmon and brown trout. Tuition with ghillie available if required. Rental prices from £400 per week. Discount rates for fishing breaks. Alvie House is an Edwardian style shooting lodge which provides fully catered accommodation for groups with facilities for weddings, conferences, corporate entertainment, shooting and fishing parties, etc. Self catering cottages, flats, chalets and caravans are also available on the Alvie & Dalraddy Estates. 3 miles south of Aviemore. 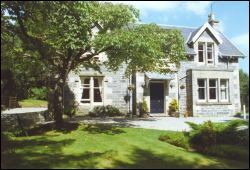 Allt Gynack is a 3 star guest house in Kingussie has 5 bedrooms (double, twin, single, family). WiFi available. Pets welcome. Contact Jen and Martin Stone. Tel: 01540 661081. Coig na Shee Guest House in Newtonmore offers 4 star accommodation in 5 ensuite bedrooms (double, twin, king size). WiFi available. Recommended in 'Scotland the Best' by Peter Irvine. Contact Marion & Graeme Broad. Tel: 01540 670109. 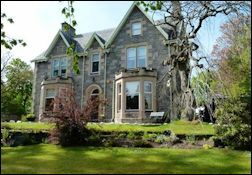 Dunallan House is a 4 star guest house in Grantown On Spey. Choice of 7 ensuite bedrooms including single, double, twin, triple, family rooms and a honeymoon suite. Contact Jayne & David Graham. Tel: 01479 872140. Garden Park Guest House offers 4 star B&B in Grantown-on-Spey. 5 bedrooms (four poster, king-size, double and twin). Dinner by prior arrangement for parties of 4 or more people from June to September. Contact David and Angela Wood. Tel: 01479 873235. Gowdenstane is a 3 star B&B with 1 ensuite bedroom (sleeping 2 - 3 people). Situated in Kingussie. Evening meals available. 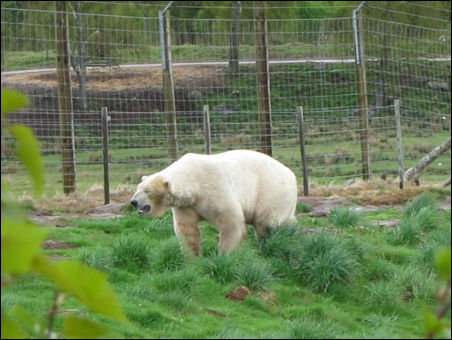 Guided day trips to see wildlife, castles, distilleries, etc. can be arranged with your host who is an experienced nature guide. Tel: 0791 4647562 / 01540 661944. Holmhill House is a 4 star guest house with 6 rooms in Grantown on Spey. Contact Mike and Mel Fitzhugh. Tel: 01479 873977. Speyburn House is a B&B with 3 bedrooms in Archiestown, near Aberlour in the heart of the Spey Valley. Tel: 01340 810 543. 20 Munro Place in Aviemore offers self catering accommodation for up to 6 people (3 bedrooms). Short breaks from 2 nights are available. Creag Mhor in Aviemore offers self catering for 4 people with a sizeable lounge/dining area, fully fitted and equipped kitchen, large bathroom with bath and separate walk-in shower and 2 twin bedrooms. Short breaks sometimes available. Instant online booking. Dulnain House (sleeps 11 - 12) and Thistle Cottage (sleeps 7-9) are 2 self catering houses in the quiet village of Dulnain Bridge. Scottish Tourist Board 4 Stars. Telephone: 01479 851359. Fishing tuition and permits for the River Spey can also be arranged. Great North Lodges - 10 self catering properties in the Cairngorms. Choice of properties sleeping from 4 - 16 people. 5 star luxury lodges, 4 star and 3 star cottages. Locations in Aviemore and surrounding area. Tel: 01479 812266. Kilburnie Lettings have a choice of 3 self catering properties. Al 4 Stars. Balgowan House is a large modern house with 4 bedrooms near Laggan, Newtonmore (sleeps 10). Glenfairn House is a large house in Newtonmore with 4 bedrooms (sleeps 14). Glenfairn Apartment is a 1-bedroom ground floor flat in Newtonmore (sleeps 2 - 4). Loch-an-Eilein Pottery (2.5 miles south-west of Aviemore on the road to Loch-an-Eilein) offers self catering accommodation to rent for 3 or 7 days (sleeps 5-6). Pottery classes also available. Contact Penny Weir. Tel: 01479 810 837. Netherwood House is a large self catering property on the outskirts of Newtonmore. Ideal for groups/families. 4 bedrooms. 3 stars. Pinebank Chalets - log cabins and apartments at Craigellachie House, Aviemore, by the River Spey. The Treehouse is a unique timber lodge set in almost an acre of mature pine and birch wood, with views of the Cairngorms and Boat of Garten Golf Course. Sleeps up to 7 people in 3 bedrooms. Abernethy Bunkhouses offer budget accommodation for pre-booked groups only: 6+ in Nethy Station & 15+ in Nethy House. Catering available if required. Activities can be arranged. 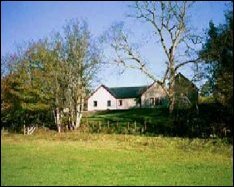 Contact Richard and Patricia Eccles, Nethy House & Nethy Station, Nethy Bridge PH25 3DN. Tel: 01479 821370. Ardenbeg Bunkhouse in a residential part of Grantown-on-Spey offers child-friendly bunkhouse accommodation for up to 24 (in rooms of 4, 5, 6 and 8). Tel: 01479 873283. Aviemore Bunkhouse, Dalfaber Road, Aviemore. Tel: +44 (0)1479 811181. Newly built independent hostel for up to 40 people. 8 en-suite rooms sleeping 4, 6 or 8 people, plus 2 family rooms with double beds. All facilities. Wheelchair access. Credit cards accepted. Member of the Scottish Tourist Board. Glenbeg Bunkhouse is on the Glenbeg Estate near Grantown on Spey. Sleeps 27 people in 3 rooms (2 bunk-rooms of 11 and 12 beds each, and a 4-bed room). An adjacent 4-bed summerhouse is also available. Both are available for group bookings all year round. Tel: 01479 873283. The Lazy Duck Hostel at Nethy Bridge is a mountain hut style bunkhouse with accommodation for 8. Campsite also available. Tel: 01479 821642. Newtonmore Hostel - at the rear of Craigellachie House, Main Street, Newtonmore. Purpose built with 2 rooms with 5 bunks, and 1 room with 2 beds. Tel: 01540 673360. Strathspey Mountain Hostel - Main Street, Newtonmore. Refurbished victorian villa with 4 rooms (2 with 6 beds, and 2 with 3 beds). Tel: 01540 673694. Slochd Mhor Lodge by Carrbridge offers 4-star self catering accomodation for up to 28 people. Ski hire, cycleshop/workshop, mountain bike hire on site. Buy the Explorer Map for Cairn Gorm & Aviemore produced by the Ordnance Survey which is very useful if you will be hiking or backpacking as the scale is 2.5 inches to the mile (4 km to 1 cm). Even more detailed maps are available if you are going to focus on a particular place, such as Landranger Map 0035: Kingussie & Monadhliath Mountains. Cairngorm Walks by John Brooks is available from Amazon.co.uk. Get the Official Tourist Map for the Grampian Highlands which shows all the places of interest to visit locally if you are driving around. If you are heading further north, then there's also the Official Tourist Map for the Highlands of Scotland. 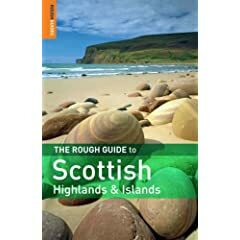 64 pages of walks by Richard Hallewell in this popular area of the Highlands.